One Savvy Mom ™ | NYC Area Mom Blog: Pinterest Quotes Pop-Stick Magnet Kids Craft Tutorial - Super Cute Homemade Kids Gift! 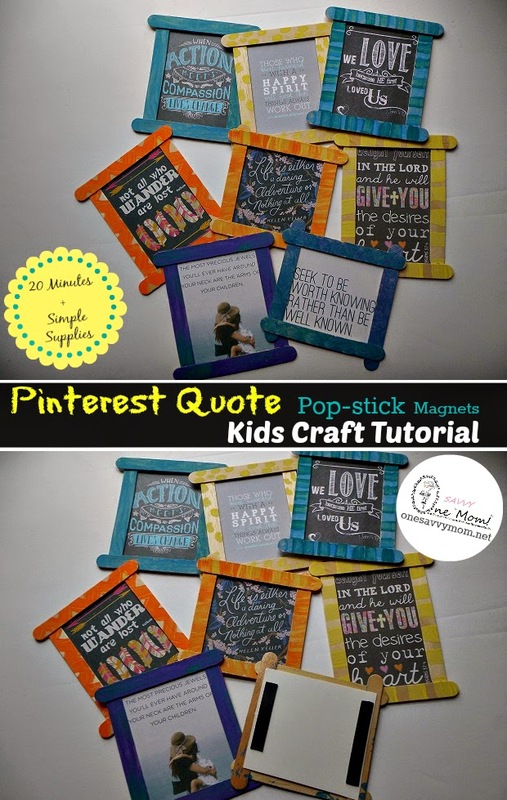 Pinterest Quotes Pop-Stick Magnet Kids Craft Tutorial - Super Cute Homemade Kids Gift! Pinterest quotes. I absolutely love them. I regularly spend time in the morning scrolling through quotes on Pinterest with my morning coffee. It's my daily Zen. As moms, we all need that, right? My daughter knows how much I enjoy reading through quotes on Pinterest and recently talked me into a craft project to display some of my favorite quotes. We printed off some of my favorite quotes from my "words to live by" board. Then, she made me these cute magnets for our refrigerator, using pop-sticks and simple supplies from around the house. I think that these magnets are super cute and would make great homemade kids gifts! One of my favorite parts about this kids craft? It's pretty frugal! Each magnet costs mere pennies to make. Gather up the simple supplies listed below - free-up about 20 minutes - and get to crafting with the kids this afternoon! Print off quotes from Pinterest (choose the 3" x 5" size setting and chose not to "fit to frame" when printing). Mount each quote on card stock or poster board using glue stick (allow adequate time to dry then Trim excess to size. Paint / design your Popsicle sticks as you choose. You will need 4 for each quote. (Allow adequate time to dry). Use dots of heavy glue or your low-temp glue gun to secure/assemble the Popsicle sticks to the quote (see image above). Allow adequate time for glue to dry. Secure two 2" strips of adhesive backed magnet to the back of each quote (one to the top and bottom). Make sure that the adhesive backed magnet is secured to the card stock or poster board and not the Popsicle sticks. The adhesive on the magnet tends to adhere better to paper/cardboard than the wooden Popsicle sticks. Click HERE for more fun & frugal craft tutorials.